Porcelain enamel, also called, vitreous enamel, is a scratch-resistant coating made by fusing powdered glass to metal and other underlying materials by way of fire. The glass cools to form a smooth and durable coating for a variety of modern uses. Porcelain enameling was first discovered in pottery and jewelry of ancient Egypt. Ancient Romans also used the technique in glass and metal works. 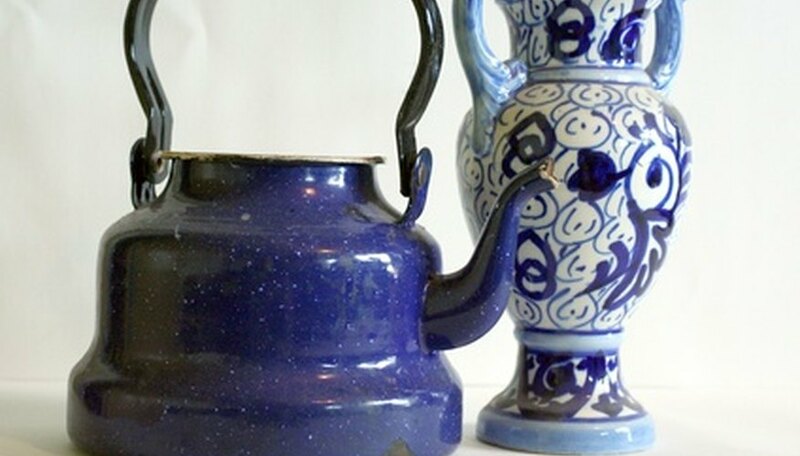 Greeks, Chinese and Russians of antiquity also used porcelain enamel on metal. Porcelain enamels provide great wear and abrasive resistance at any thickness, as well as great flexibility for more pliable sub-surfaces. They may be used to lubricate rubber pipes without impairing their flexibility. Modern uses for porcelain enamels include nonstick cooking ware, kitchen appliances, classroom writing boards and billboard signs. Graffiti artists, to their dismay, will find porcelain enamel in train stations: The slick finish does not hold many kinds of paint and inks. Based in New York City, Adrian Archer has been writing professionally since 2009. While he strives for his big break as a screenwriter, he makes his mark with health and electronics-related articles. Archer holds a Bachelor of Arts in communication studies from the University of North Carolina.